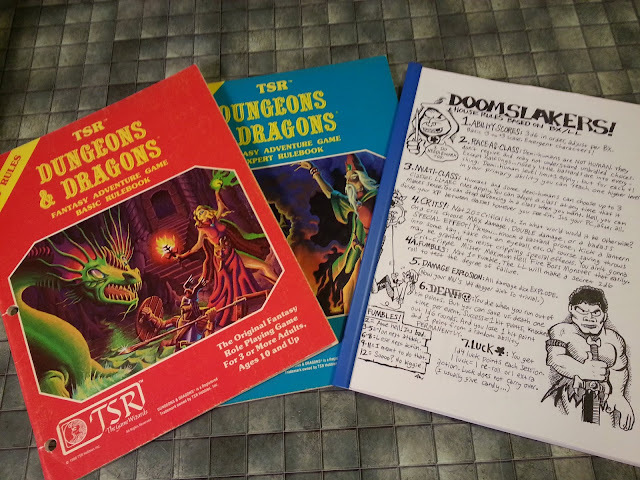 When I put up yesterday's post featuring a pair of TSR's Dungeons & Dragons comic ads from the early 1980's it was merely as a means to share a little nostalgia from a personal perspective. However, when I was writing the post, I started to notice details in the ads that made me think about how the ads exemplified certain aspects of the game. After reading some of the comments the post generated, I got to thinking that it might be amusing to dissect the ads frame by frame from a D&D player's point of view. Up first, "Ad 1," circa August, 1981. This ad is presumably the first of the series - I certainly have not found any that appear to belong to an earlier point in the story arc they represent. 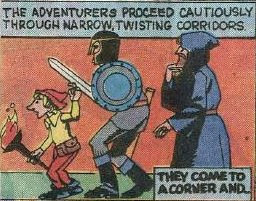 Working from this assumption, here we see a classic D&D conceit: the adventure beginning with the player characters standing at the entrance to the dungeon. Of course, one could make a valid argument that we're simply entering the story in media res - fair enough, and possibly supported by evidence we'll examine while discussing the next ad. In this case, the dungeon is to be found behind "a secret door in the ruins of Zenopus Castle." 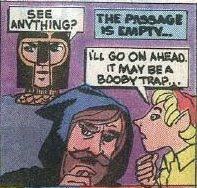 This frame also introduces us to a core conceit of the game: the adventuring party. This one consists of three player characters: a fighter, an elf, and a magic-user. (Note that Indel is just an "elf" - albeit a particularly short one. Obviously, this isn't a game of Advanced D&D.) The party even appears to have a defined marching order, with the fighter dutifully fulfilling his role as a meat-shield. As the shadow of the shambling mound falls over the party, we see that Valerius is a bit of a weeny, as fighters go. 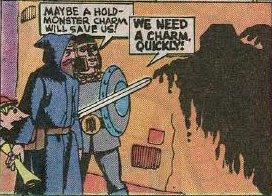 Heck, he practically begs Grimslade to cast a "charm" to "save" the party (even resorting to raising his voice). We also see that Indel isn't as brave as he earlier led us to believe, as he cowers behind Grimslade's robes. (I'm leaning more and more toward him being a greedy little you-know-what. I bet his player wanted to play a thief, but didn't get good enough ability score rolls.) 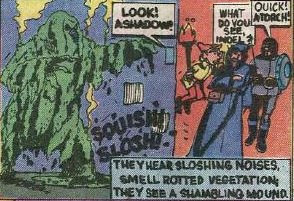 Of course, in Valerius' and Indel's defense, that is a very threatening shadow. I find it interesting that the term Valerius uses here is "charm" instead of "spell." I'd have to give kudos to Valerius' player for not defaulting to player knowledge of the game term in this situation. Oooohhooohh - our first spell! This frame really caught my attention when I put up yesterday's post. 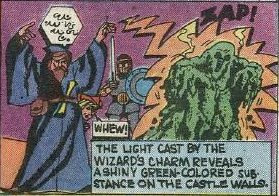 Second, when the spell fires off, not only does it possess an audible element ("Zap!") but it also gives off light. (We know that the light is not merely there to serve as an artistic emphasis because it's this light that reveals the green slime on the walls.) I had never considered that hold monster might appear this way when cast. It really reinforces something I've come to understand: that the spell effects found in the book are not the spell appearances. I know for certain that I, personally, have been allowing spell casting to be handled in far too mundane a manner in my games. I plan to use spell appearances to enhance the sense of wonder in future games, and this frame will serve as a good reminder to that end. 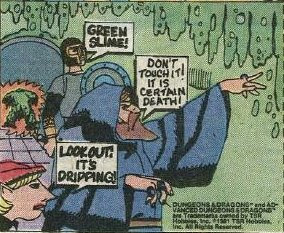 At last, we're introduced to one of my all-time favorite D&D monsters: green slime! Oh, how I love inflicting this stuff on my players. (Ask my fiancee if she remembers her elf trying to crawl under the portcullis trap - only to find out about the patch of green slime lurking in the shadows over the doorway. Muhahahahahaha) I'm pretty sure my love for the stuff was inspired by the next ad - and probably subconsciously fueled by my love for 50's sci-fi movies and my enduring affection for another childhood toy and 70's icon. In terms of the story, there's not much to see here, as this is the ad's cliffhanger moment. Next time we'll tackle the second ad - and the appearance of a fourth party member. Stay tuned! And yes to the "de-mundanizing" magic. I'll be running D&D for the first time in forever this weekend, and all the house rules I've been finding (here and on related blogs) to make spellcasting a more monumental, quixotic, and generally fraught affair are much-appreciated! I agree with the previous poster that it's fun to try and figure ways to add mystique back to the game. I played Labyrinth Lord a few months back and I really enjoyed describing kobolds instead of just naming them. That small detail really added to the experience. ^^^ Ah, that reminds me of an experimental campaign our group's main GM ran--we knew our character's persona, backstory, occupation, etc. But we didn't know their stats. And we didn't do any rolling our GM took care of it all. The setting was a rather low-key, accurate medieval world, but our reactions to events wasn't--we were attacked by a few goblins (although, like the above poster did, the GM only described them) and the encounter freaked us out; knowing nothing specific numbers-wise really made it come alive. b) For most of my young life, when trying to draw fighters, I nearly ALWAYS attempted to emulate Velerius' helm. Indeed, I STILL doodle it even today.